Culver Bulldogs lose to Chemawa Braves, 81-41, Heppner Mustangs 61-31, Delphian Dragons 66-53. The Culver Bulldogs traveled to Heppner, losing to the Mustangs 61-31 on Dec. 15, and lost 81-41 to Chemawa on Dec. 13. The Bulldogs had trouble with the size of the Mustangs. Heppner has five players over 6 feet tall, including a 6-foot-10-inch tall center and 6-foot-5-inch forward. "We had a shaky first quarter, but they are an unbelievably huge team," head coach Johnny Wilson said. "A lot of their players were probably over 200 pounds and they looked like a junior college team getting off the bus. That obviously presented a challenge for us, since we are pretty small." "All things considered, we had a game plan and fronted their posts," he said. "Once we figured out what they wanted to do, we made adjustments and played pretty good. We had a couple runs and cut it to single digits a few times." The Bulldogs went into halftime only down by 11 points, with the score 34-23, but came out ice cold in the second half. "I would not say the final score is indicative on how the game went," Wilson said. "We just went cold in the second half; we were able to get the same shot and defended well. The team was able to hold them to less points in the second half. So defensively, even with their size, I thought we played pretty well. We just could not get the lid off in the second half." Culver also had some trouble making their free throws, shooting 10-for-21 at the stripe. "We have been a solid free-throw team this year, so missing free throws really made things hard," said Wilson. "Had we been able to score with consistency, I think we really could have stuck with them." "Honestly, it was a pretty good game despite the final score," he said. "We left there actually feeling pretty confident about how we played. After the Chemawa and Delphian games, I don't think anyone had a real good taste in their mouth about how those games went. Despite the score, it was promising to see us play well." The Bulldogs lost 61-31 to Heppner, but were led by Luke Spinelli with 13 points. Jordan VanAlstyne had 11 points and six rebounds and Cord Gomes finished with 6 points and six rebounds. In the Chemawa game, the Braves were able to force pressure and make Culver turn the ball over. The Bulldogs had their biggest loss of the season on Dec. 13 and turned the ball over 29 times. The Bulldogs had an 8-7 lead to start the first quarter, but would be down 26-13 at the end of the period. Culver was able to score points in the second quarter, but they went into halftime down 45-25. The Braves kept their fast pace up and scored a total of 81 points on the Bulldogs. Culver lost 81-41 at home. VanAlstyne led the Bulldogs with 19 points, on 8-12 shooting. Spinelli also added 10 points to help Culver. 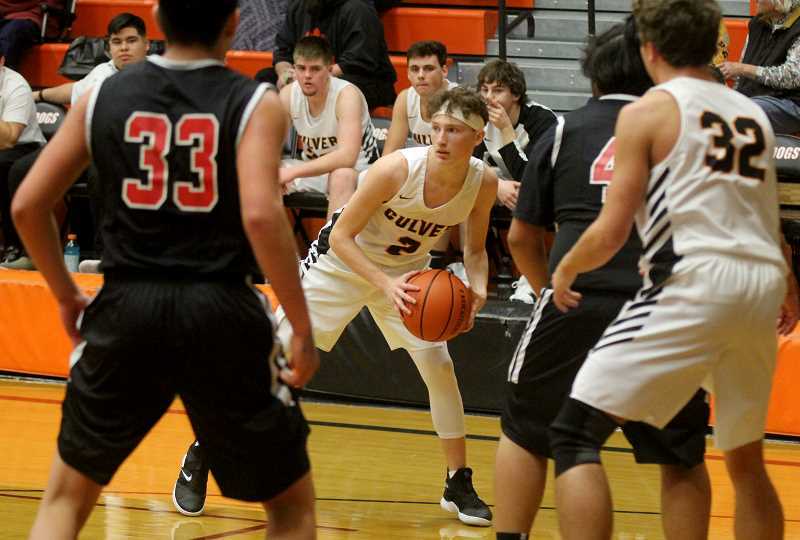 A slow start to the game has been the story of the Culver boys basketball season this year, as they lost another competitive game to Delphian Dec. 11. 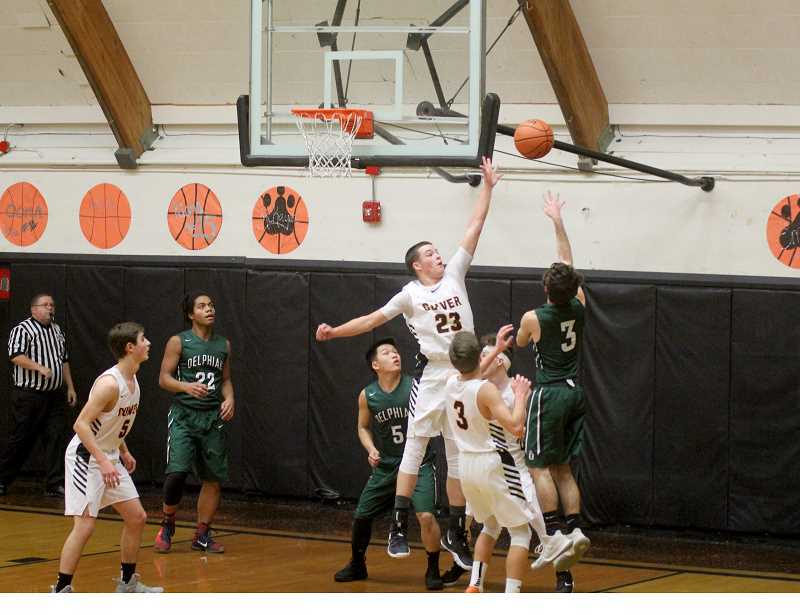 The Delphian Dragons used a trapping press on the Bulldogs to start the game and Culver was having trouble breaking the press and getting up the floor. A driving lay-in by Jordan VanAlstyne and a play later, a pass from VanAlstyne to Kobe Lamb tied the game at 4-4. Later in the quarter, another pass from VanAlstyne to Lamb created another lay-in and the Bulldogs were down 12-10. Alex Han, of Delphian, was able to hit a deep three and the Dragons were up by five. An assist by Luke Spinelli to a hustling Cord Gomes cut down Delphian's lead to 14-12, before a pair of steals and lay-ins by the Dragons made the score 19-12. Delphian had the ball with time expiring before Han took a fade-away desperate shot. The ball went up and right in the hoop and the Bulldogs went into the second quarter down 22-13. The Bulldogs were trading baskets with the Dragons to start the second quarter and a pair of free throws by Lamb made the score 27-22 in favor of the Dragons. With a mix of 3-pointers and lay-ins, Delphian went on a 9-3 run to end the second quarter and Culver went into halftime down 36-25. In the third quarter, Culver scored 18 points off free throws and a hot hand from Spinelli. Spinelli hit three 3-pointers and the Bulldogs were down 52-40 to start the last quarter. Culver came into the fourth quarter focused and energized. A lay-in by Eli Tapi, a pair of free throws and a beautiful jumper off a pump fake by Spinelli made the score 52-46. The Dragons made a pair of free throws, but a drive by VanAlstyne and a jump shot by Engel made it a 4-point game. Culver was only down 54-50 halfway through the fourth quarter. Delphian went on a 6-0 on lay-ins and free throws and with Gomes fouling out of the game, head coach Johnny Willson called a timeout down 60-50. A drive from Vanalstyne cut the Dragon's lead down to seven, but the Bulldogs were forced to foul Delphian with short time left in the game. The Dragons were able to make the most of their free throws and the Delphian Dragons beat the Culver Bulldogs 66-53. Spinelli led the Bulldogs in scoring with 15 points and Gomes added 10 points and five rebounds. VanAlstyne had a balanced game with 9 points, seven rebounds and five assists. "We didn't play very well," Wilson said. "It is hard to win games when we don't play as good as we can. We have enough disadvantages as it is, so when we don't shoot well and turn the ball over, we put ourselves in a big disadvantage. That is what happened tonight and it has happened a few time this year — slow start that we could not get out off." "I think just not putting ourselves in the position that we have been at the start of the game," Wilson said about slow start adjustments. "If we don't go down by 10, 12 at the first quarter, then the run we have doesn't put us down by four, but up by eight or 10. I don't know if we are just more comfortable playing from behind, but we don't start playing well until we are down 10. We just need to flip the script, jump on a team early and give ourselves an early advantage." The Bulldogs have a home game on Dec. 20, against Taft, but do not play another game until Jan. 3, when they travel to Sheridan. During that time, coach Wilson and the Bulldogs will be looking to make some adjustments and use the practices to help improve on the things missing. "I keep joking with the kids that ever since we have played our first game, we have had an NBA-type schedule," he said. "Game, practice, game, practice. We have only had two consecutive days of practice once. All the adjustments we have made have been on the fly. We try and put new things in, but also keeping kids fresh and getting shots up has been tricky. "The team is really looking forward to the break, so we can break things down and work on it," he said. "Things like zone offense — we struggle when teams play a zone. We don't have the best 3-point shooters, but our spacing has also not been good." "Part of it is lack of experience, but we also haven't been able to get in and grind," said Wilson. "Hopefully, this break will let us really work on things."